I’m listening to you guys. You wanted some C++ tutorials so here we go. I will do more C++ stuff later. Next step with the project is to add level selection screen. I will create base data classes in C++. All of those will be visible in level selection screen (which I don’t have yet ) so I will create structure and enums inside C++ for later use. And last one – most important: if you know how to blueprint you can learn C++ to create variables and math functions without a problem. It will be hard from start to understand UE4 macros but you should try. Learn by watching Epics code! This is the way I’m using. 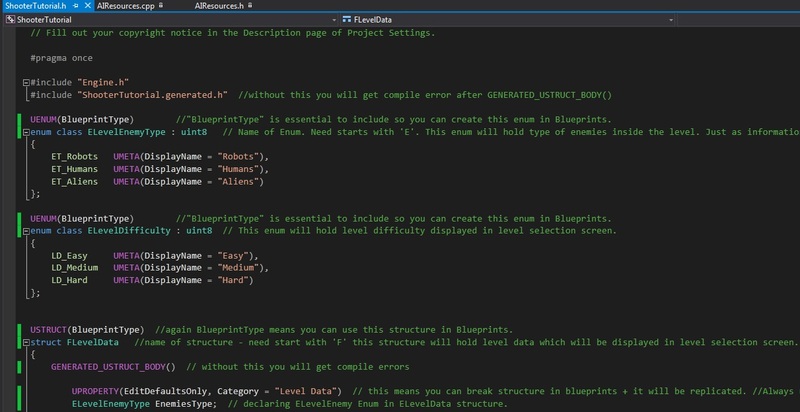 If I want to create blueprint pure function I’m searching one that was created earlier by Epic and trying to copy it with my variables / references. Watch all Youtube “UE4 C++ Tutorial” especially from Epic. If you want to use C++ in your project simply add blank code to project. It will ask you to download Visual Studio – just do the whole steps. Restart your computer and again add code to project. Then restart your editor. 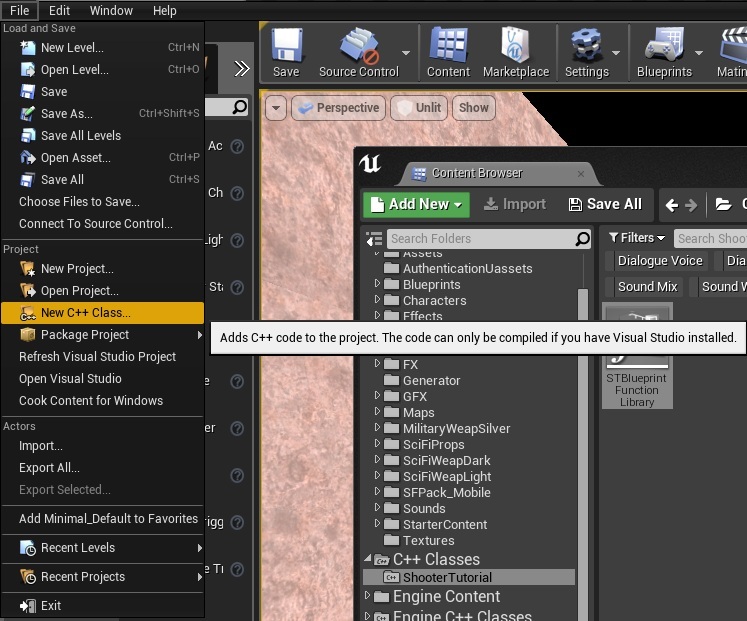 If you don’t know how to open Visual Studio use FILE -> OPEN VISUAL STUDIO from Editor. Navigate your project .h file. I have named my project “ShooterTutorial” so it’s ShooterTutorial.h file. You can add Enums in every class. I’m using project .h file because it sounds like it’s global. UENUM(BlueprintType) //"BlueprintType" is essential to include so you can create this enum in Blueprints. enum class ELevelEnemyType : uint8 // Name of Enum. Need starts with 'E'. This enum will hold type of enemies inside the level. Just as information in level selection screen. enum class ELevelDifficulty : uint8 // This enum will hold level difficulty displayed in level selection screen. Please read comments inside the code for explanation. Now if you compile your project you can create new Enums in Blueprints from LevelEnemyType and LevelDifficulty. USTRUCT(BlueprintType) //again BlueprintType means you can use this structure in Blueprints. struct FLevelData //name of structure - need start with 'F' this structure will hold level data which will be displayed in level selection screen. UPROPERTY(EditAnywhere, BlueprintReadWrite, Category = "Level Data") // this means you can break structure in blueprints + it will be replicated. //Always use UPROPERTY() macro in variables. ELevelEnemyType EnemiesType; // declaring ELevelEnemy Enum in ELevelData structure. float LevelTime; // levels will be time based that's why we need to declare how long we can play before end of the level. float HiScore; // we will store HiScore in this structure so it can be seen in level selection screen. UObject* SequenceData; // reference to Object which will store sequence of enemies for the level. FString LevelToLoad; //name of the level to load. Please read the comments for explanation. After compiling you can create new variable of LevelData structure type! It’s so simple! I would need to move ShooterTutorial blog to custom server to get the code highlights…for now please use PasteBin links. Here you can find whole code for enums and structures. 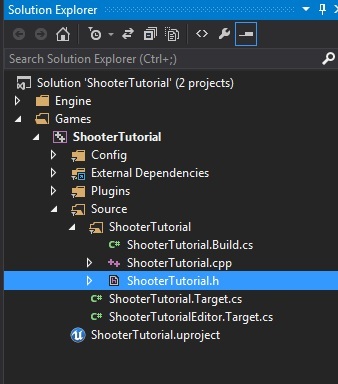 Remember that my project name is ShooterTutorial – your will be different! thanks, I have problems building projects with C++ in them, blueprints works much better for me on the Mac.